Hello from Designer Chris! 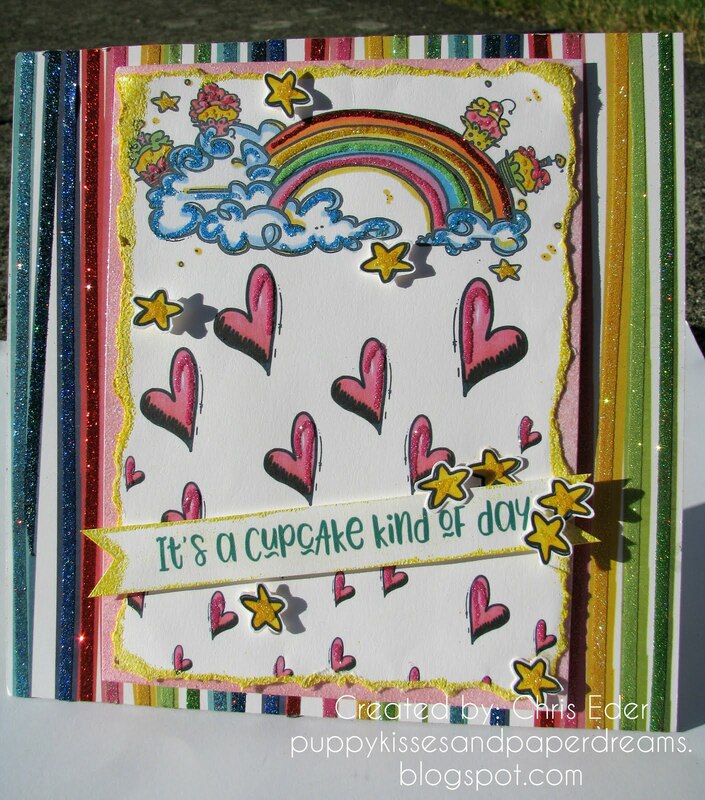 A super sparkly, rainbow and cupcakes and cascading hearts card on the blog today! 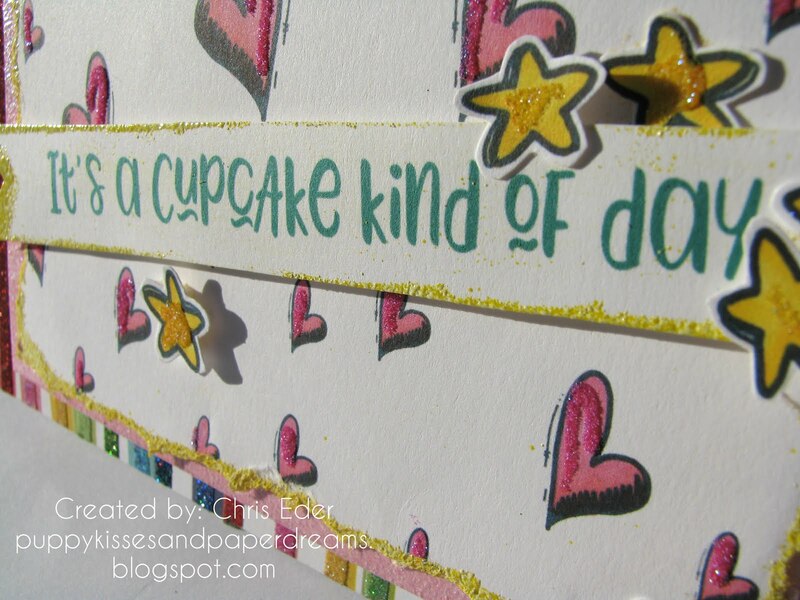 This card showcases Sparkle N Sprinkle's new Cupcake Rainbow stamp set for July. 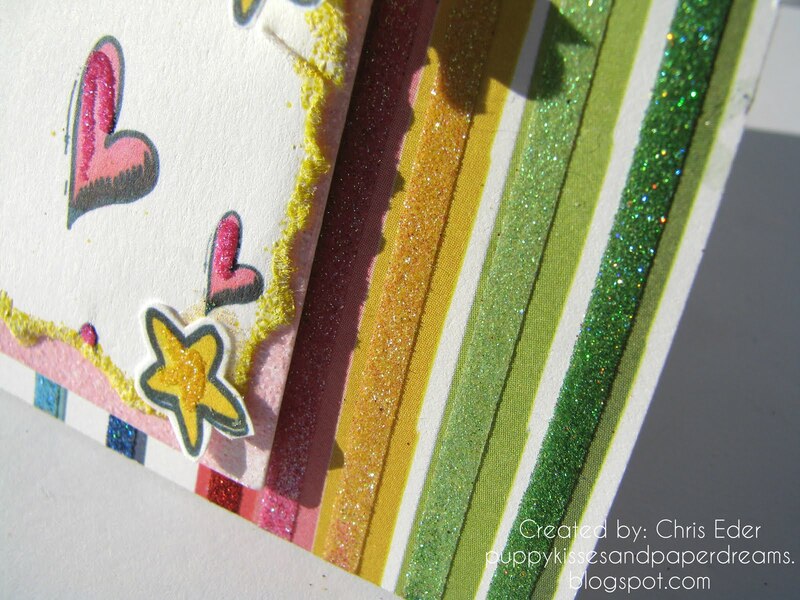 Let's check out all the fun and sparkle on this card! I sized these pre-colored digi images on my computer, in Word. Once I had the sizes I wanted, I printed them with my ink jet printer onto white cardstock. 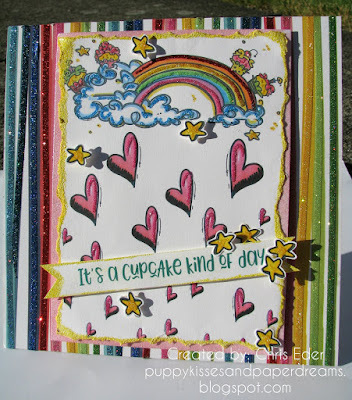 I ripped the edges of the image to get a distressed look (more on that below) and then started decorating and embellishing the rainbow and cupcakes! 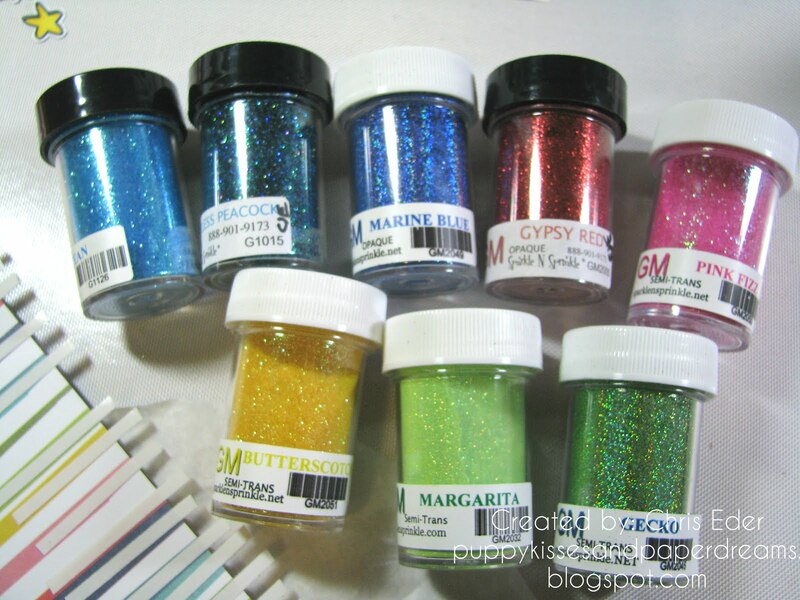 I rolled on some Nuvo Smooth Precision Glue Pen onto each of the rainbow arches, and sprinkled on glitters: Gypsy Red for the red, Butterscotch for the yellow, Margarita for the green, and Pink Fizz for the purple/pink. I also used the same adhesive for the clouds and cupcakes, and sprinkled on Marine Blue for the blue, Butterscotch for the stars, and Pink Fizz for the cupcakes. I laid out a bunch of hearts, and sized them smaller and smaller as they cascades away from the rainbow. 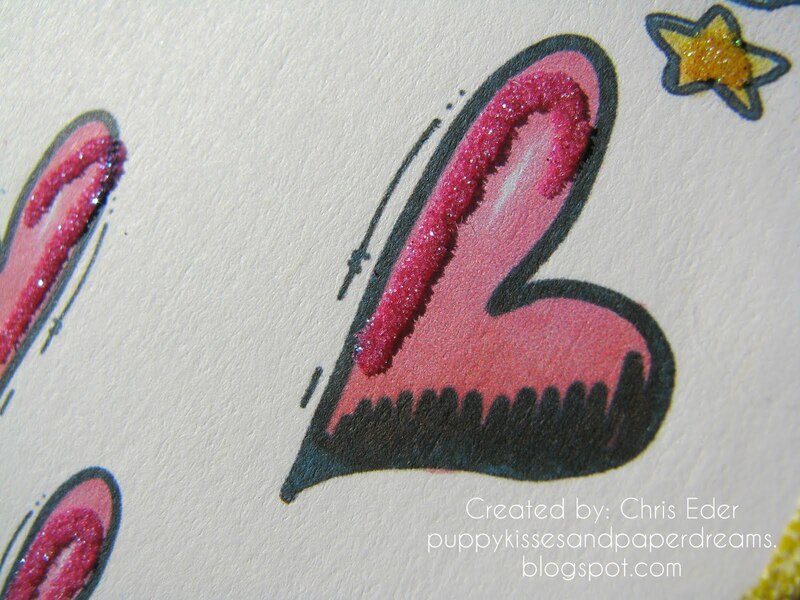 I rolled on more Nuvo Smooth Precision Glue Pen onto the hearts, and sprinkled on Pink Fizz glitter. I just enhanced the hearts with glitter highlights, I didn't cover the entire heart, as you can see below. I printed out the sentiment, trimmed it with my Tonic Guillotine cutter, and then swiped on Versamark ink along the edges, sprinkled on Lemon Chiffon embossing powder and heat set it. Here is a close up of the sentiment. I layered the card panel over some patterned paper. I used the Koi Pond paper sheet from the Photo Play Paper Crane Collection Pack. When I pulled out this sheet, and saw those delicious rainbow stripes, I just knew I had to use the paper, and bling up those stripes! 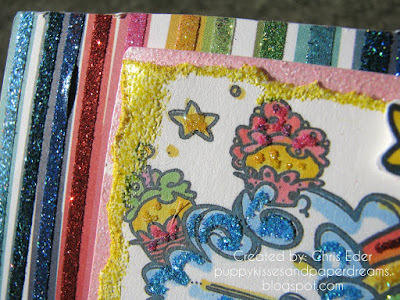 I laid down 1/8" Tear-ific Tape onto each of the stripes, and selected glitters to match the stripes as best I could. Here is a closeup of some of the stripes. Squeal! I LOVE this part of this card! Wow! Here is a pile of the glitters that I used for the stripes. 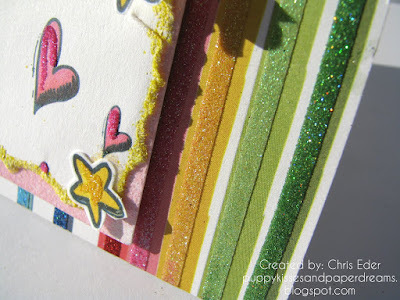 You can also see the patterned paper in the bottom left, with all the 1/8" Tear-ific Tape strips on each stripe. I revealed one stripe at a time, sprinkled on the coordinating glitter, burnished the glitter in, brushed it off with my awesome glitter brush, then went to the next stripe. This went pretty fast, and it sure was fun! And, to cap it all off, after I ripped the edges of the digi stamp image, I swiped the edges with Versamark ink, and then sprinkled on Lemon Chiffon embossing powder and heat set it. I also cut another card panel, slightly larger than my stamp image piece, and swiped Versamark ink on that layer too. I sprinkled on Princess Rose embossing powder and heat set it. 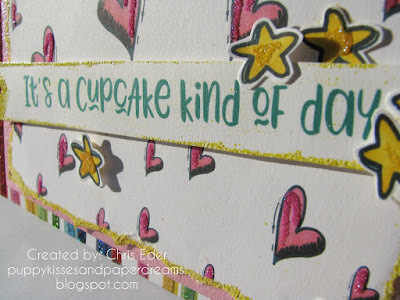 I layered these two together, and layered them over the patterned paper with glittery stripes. I love this card. These coordinating glitters over the striped background paper makes me smile. 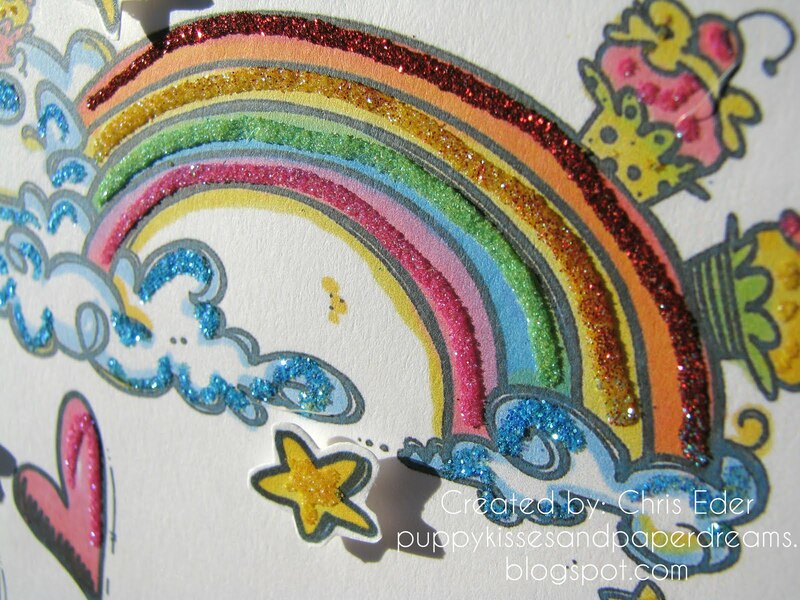 I also love that sweet rainbow and the adorable hearts cascading down. Lots of bling and sparkle on this card - which is my cup of tea!